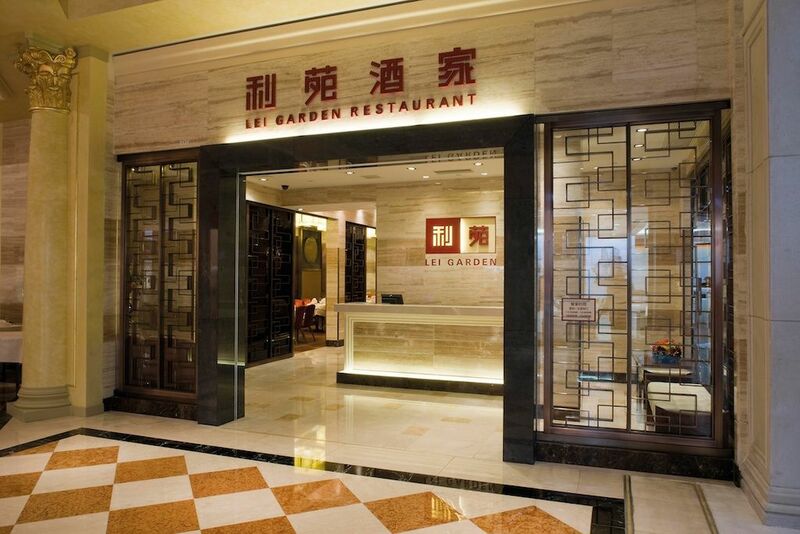 This Macau outlet of the famed Chinese restaurant chain Lei Garden is conveniently located at the Grand Canal Shoppes at the Venetian, a perfect spot for shoppers who want to rest their feet and hungry gamblers who want to feast on some authentic Cantonese fares. Carpet, white tablecloths and simple décor featuring red and gold help create a warm and elegant setting. Tables are spaciously arranged; the booth and red velvet seating near the entrance can seat intimate parties of four, offering a more quiet and relaxed atmosphere. The main dining room is usually filled with large tourist groups or families alike, which can create a bustling and noisy environment. The menu of Lei Garden Macau is similar to its Hong Kong counterparts, offering a good range of classic Cantonese dishes, dim sum, live seafood, soup and barbecued favourites. We start on a high note with a barbecue combo of the restaurant’s signature crispy roasted pork and traditional barbecued pork. The roasted pork belly arrives in eight bite-sized square pieces, every cube is perfectly composed of alternating layers of fat; lean but tender meat and a crispy, golden-coloured crackling. The char siu is also satisfyingly moist and succulent. Recommended by the restaurant manager, we order another poultry dish, the crispy roasted chicken. The half-chicken was disappointingly bony and springy, although the skin is nice and crispy. A tofu ensemble is a light and refreshing dish, and another speciality of the restaurant. Translated to “thousand leaves” in Chinese, the steamed tofu slices are sliced razor thin and beautifully presented in a circle surrounding a mix of diced pork, mushrooms and peppers. Overall the dish is cleanly flavoured but the thick and sticky oyster sauce and cornstarch mixture ruins the otherwise beautiful simplicity of the dish. Moving onto the carbs, we order the poached rice with crab and seafood in soup, which is similar to the Chiu Chow-style pao fan. The boiling pot of soup and rice is served in a casserole tableside. The orange-coloured broth lacks the sweetness of the crab but the saving grace are the dried fish flakes and crispy rice, which provide a nice textural contrast to the dish. To finish, we try the homemade almond sweetener, which is served cold but not too icy or sweet and gently aromatic. Another typical Chinese dessert we try is the chilled mango sweetener with grapefruit and sago. The slight tartness of the grapefruit along with the sweet taste of mango make this a delightful treat. Unusually, the a la carte menu at dinner also provides a short list of dim sum delicacies including steamed custard bun and dumplings, suitable for those who want a lighter meal. However, one of our dim sum favourites, pan-fried turnip cake, is only available at lunch. Wine is certainly not the focus at Lei Garden. The layout of the wine list is disorganised - mixing up wine regions and grape types; and the staff also has limited wine knowledge and miscommunications can quite often arise. Nonetheless, there is the inclusion of rare vintages such as a 1982 Château Lafite Rothschild; and adequate selections by the bottle from both old and new worlds, plus one house red and one house white available by the glass. A selection of Chinese white and yellow wines are also available including a 30-year moutai. Service is the standard of more casual and local Chinese restaurant - quick, efficient, no-frills and brusque. The staffs tend to stop us from ordering the thing we want, either because that is not a popular dish or the portion is perceived to be too large for two. Overall the restaurant is geared towards a more local or mainland market, and non-Chinese speakers may find it difficult to navigate. Be sure to check the bill carefully as there might be additional dish added to it. A modest dinner for two with wine comes to about MOP950, without ordering any high-priced seafood delicacies, which is expensive considering the food and service on offer. However, Lei Garden is still the place to go for good dim sum and a satisfying lunch should cost about MOP300 per head.